Hikvision; The Chinese manufacturer and supplier of video surveillance products now launched 4 in 1 CCTV camera in Pakistani Market. The four in one camera is capable to provide four types of video outputs which are available to support CVBS (Analog) DVR, CVI (Dahua DVR), TVI (Hikvision DVR) and AHD (Chinese made low cost DVR). You can read the difference between AHD, TVI and CVI at our website linked below in cameras models. With this type of camera now CCTV installers and solution providers can use Hikvision cameras with different types of DVR. Now they can connect Hikvision camera with Dahua DVR, Hikvision camera with AHD DVR and Hikvision camera with Analog DVR. 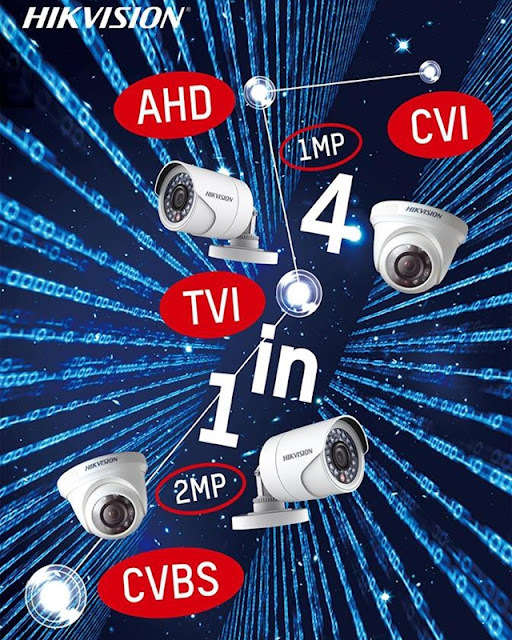 Initially Hikvision Pakistan launches four new CCTV Cameras models in Pakistan. These latest CCTV Cameras models are available in shops now. Click for Hikvision Cameras price in Pakistan.